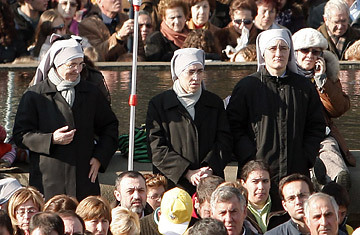 Hundreds of thousands of people gather for a family values protest in Madrid, December 30, 2007. When Pilar Jiménez wed in 1961, she knew her marriage would last. "Back then, no one separated," says the 71-year-old Salamanca resident. "Marriage was for life." Indeed, her union endured until her husband's death two years ago. But if her marriage was typical of its era, so too are those of her ten children  five of whom are now divorced. That puts her family roughly at Spain's national average these days. The rate of broken marriages has risen steadily since Spain legalized divorce in 1981, but a recent reform allowing couples to accelerate the divorce process has caused those numbers to skyrocket. Spain now has one divorce for every 2.3 marriages  an increase of 74% in the past two years alone. "Divorce may be a sin, but if the marriage is hell, why would you stay?" asks César Borrego, 35, one of Pilar's sons, who was divorced from his wife in 2006 after eight years of marriage. It was a contentious divorce  the couple have two children and César sued for shared custody  but less difficult, in some ways, than that of his older brother Kiko, who split from his wife in 1992 after three months of marriage. "Because of the law then, we had to wait until we had been married a year before we could even file for separation, and we had to wait another year until we could file for divorce," says Kiko. By removing obstacles such as the mandatory year-long separation, the 2005 reform  which some have dubbed "express divorce"  has not only made it easier to end an unhappy marriage, but has made the country's divorce rate one of the highest in the European Union. For the Catholic Church, the dramatic increase in divorces underlines the threat posed by the Socialist government of Prime Minister José Luis Rodríguez Zapatero. At a December rally in Madrid to "defend the Christian family," Cardinal Augustín García-Gasco lambasted Socialist initiatives, saying, "The culture of radical laicism... leads to nothing but despair along the road of abortion and 'express divorce.'" Benigno Blanco, president of the Spanish Forum for the Family, agrees. "The reform has transformed the marriage contract into trash," he says. Spaniards certainly no longer seem scandalized by the prospect of divorce. Alberto Rubio founded divorcioexpress.com, a website that, for under $600, lets partners seal an uncontested divorce via the Internet. "We facilitate about 100 divorces a month," he says. "But we're not promoting divorce, just making it more accessible." Like him, sociologist Inés Alberdi sees little grounds for concern. "The number of divorces may have climbed, but the number of separations has decreased by almost the same amount," she says. "Before, when it came to divorce, Spain had very strange practices. Now we're more like other countries in Europe." For Pilar Jiménez, there is no doubt that some old values have been lost. "Before, family was always the most important thing," she says. "It would never have entered in my mind to separate." Still, she admits that, thanks to her children, she's become more accustomed to the idea of divorce. "They're adults," she says. "If two people are unhappy, why should they have to suffer?"